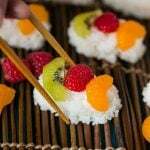 This recipe for Fruit Sushi (Frushi) is a fun and delicious snack or dessert made with lightly sweetened coconut rice and fruit – no special kitchen tools are needed to make it! 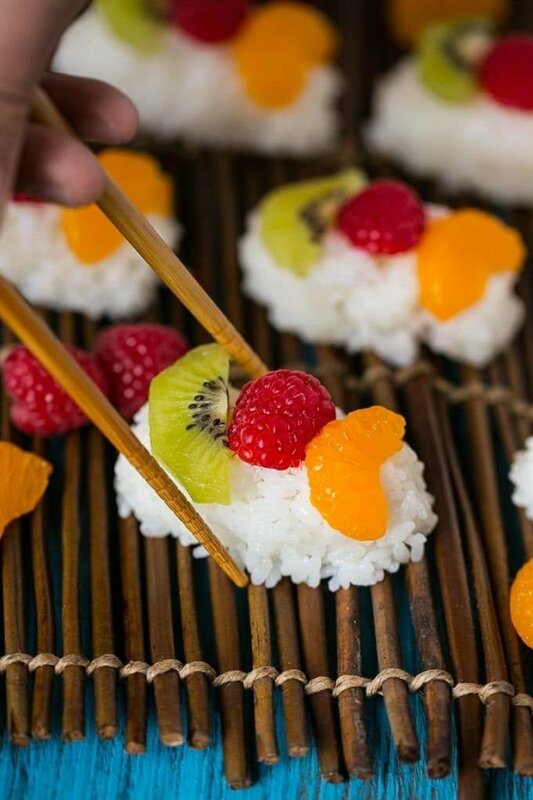 Move over raw fish, this fruit sushi is a a unique treat that kids and adults alike will love. It’s perfect for parties, snack time, or even tucked into school lunchboxes. I’ve got a really fun recipe for you today – fruit sushi (also known as frushi)! Your kids will go crazy for this sweet sushi, and who are we kidding, the adults will love it too. It makes a great snack or dessert and you can use whatever fruit is in season. Do your kids eat sushi? I have one child who likes California rolls, the other two won’t touch sushi. They like the concept, but not the actual flavors. When they saw this fruit sushi, they couldn’t wait to get their hands on it. In fact, they all crowded around while I was taking these pictures, waiting for me to give them the ok to pounce! How do you make fruit sushi? Have you ever made sushi at home before? This was my first time and it was really quite easy. The first step is to get yourself some sushi rice – regular rice won’t work. The sushi rice needs to be rinsed well and then soaked for about 30 minutes. The rice cooks like any other rice, after it comes off the heat is when you add some sugar and coconut milk for flavor. The warm rice gets shaped into ovals and topped with fruit. I used slices of mandarin oranges, kiwi and raspberries here because that’s what my kids like, but you could definitely change it up. Sliced strawberries, blueberries, blackberries or melon would be great. If your fruit doesn’t readily stick to the rice you can brush the tops of the rice balls with a little honey to act as glue. This frushi needs to chill for at least an hour before you serve it so that it has time to firm up, so plan accordingly. 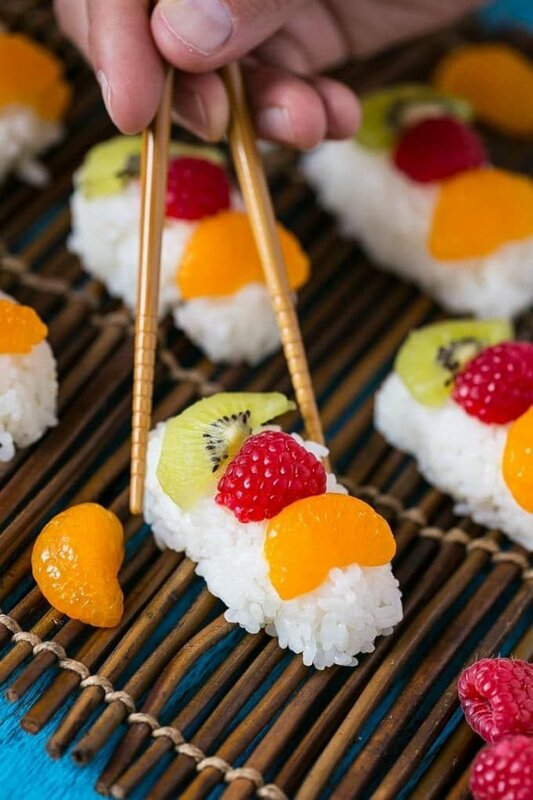 This fruit sushi would be great for a birthday party or even for a lunchbox. I’m putting it on our regular snack rotation since it can be made in advance and with the fruit that’s already in the fridge. I think next time I’ll try strawberries and melon, or maybe mango, or peaches…really the possibilities are endless! 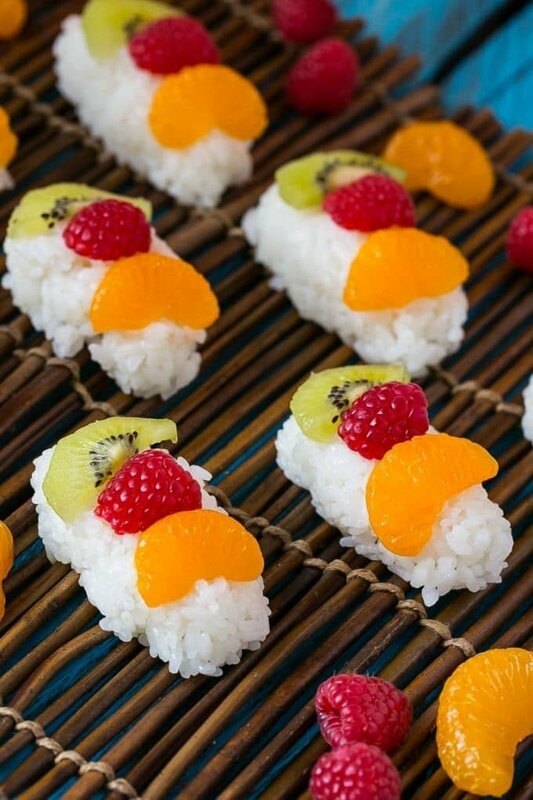 This fruit sushi combines coconut rice and seasonal fruit to make a fun treat that's perfect for dessert or a snack. Rinse rice until the water runs clean. Let the rice soak in a bowl of clean water for 30 minutes. Bring 1 and 1/4 cups water and rice to a boil in a medium saucepan. Cover, reduce heat, and simmer 15 minutes or until water is almost absorbed. Remove from heat; let stand, covered, 15 minutes. Place rice in a large bowl. Add sugar, coconut milk, and salt, stirring gently until well combined. Cover and let stand 20 minutes. Lightly coat hands with cooking spray. Divide rice mixture into 12 equal portions, shaping each into a ball (about 2 tablespoons of rice). Lightly press each rice ball into an oval between palms; place ovals on a baking sheet lined with wax paper. Top each rice oval with one kiwi slice, one mandarin orange and one raspberry slice. If the fruit doesn't readily stick to the rice you can brush the tops of the rice ovals with honey first. Cover and chill frushi for at least one hour, up to 8 hours. 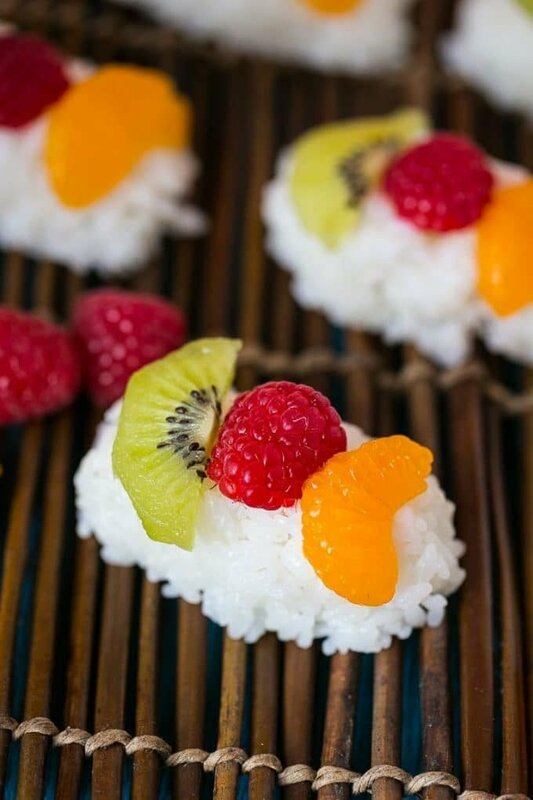 Little Helpers: The kids can help form the rice balls and decorate the tops with fruit. Make Ahead: This recipe is best made at least 1 hour in advance so that the rice has time to chill which will make it hold together better. Oh my goodness! I simply love this!! And while I’m thinking my kids would go nuts for it I’m secretly saying that cause I want it too! Very fun idea. This would be great as an appetizer or a dessert! Tks for sharing this recipe. It is a good idea for dinner tonight. I love jamapese food and i will add these sushi to my dish. I love this idea for sushi! 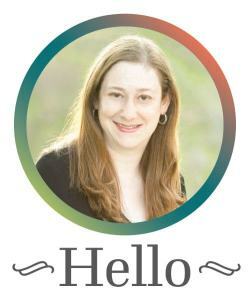 Talk about a fun treat for kids and adults alike! I love sushi but I’ve never thought to eat it this way. Gosh this is so creative and I’m sure these taste delicious. I have to try them out! I love this idea! It’s going me ideas for a summer party that I’m thinking about. This is great party food because it can be made in advance! Oh my gosh I love this!! I love the frushi!! My daughter would love this! I am thinking this would be fun for a wine night too!! It would be an awesome light bite to go with wine, great idea!